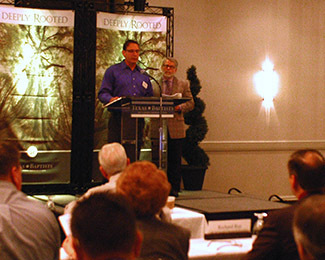 DALLAS -Baptist General Convention of Texas Executive Board convened on Mon., May 19, and Tues., May 20. Several decisions were made, including the sale of the BGCT's Dallas facility to Baylor University for $16 million. For more information on the building sale, click here. "The discussions and sale of the building is a spiritual and stewardship decision," said Dr. David Hardage, executive director. "As the face of Texas continues to change, so will the way we do church, the way we do convention and the way we collaborate to reach the state with the Gospel of Jesus Christ. Twenty-five years ago, God directed our leaders to build the facility at 333 N. Washington and that met the needs of our convention. Today, we work differently and relate differently." To read more from Dr. Hardage's letter to Texas Baptists, click here. President Jeff Johnson shared about the importance of student missionaries serving around the world through Go Now Missions. Currently, there are student missionaries serving on the field 365 days a year. Johnson shared that missionaries are in 28 countries, 19 states and 27 Texas cities. He encouraged board members to pray for students leaving for summer mission projects. Jill Larsen, treasurer, gave a financial report stating that Texas Baptist investments have experienced a $3 million increase to $117.9 million. Cooperative Program giving is down slightly, standing at $8.9 million for the first quarter, versus $9.1 million in 2013. The board adopted a relationship agreement with the Christian Education Activities Corporation, which operates as the South Texas School of Christian Studies in Corpus Christi. STSCS has trained local pastors for ministry since 1977. Pending approval at the BGCT Annual Meeting in November, the agreement will allow the BGCT to elect three of its 21 trustees and will not involve any financial responsibilities. A vote was approved to guarantee a $2.26 million loan and a $1.97 million loan for Baptist University of the Americas. Two vacancies were filled on institutional boards. George Newman was affirmed for appointment on the board at Hardin-Simmons University and Dora Fast was named to the board at BUA. The board also approved a recommendation to amend the articles of incorporation for Valley Baptist Missions Education Center. This amendment, which will be presented at the BGCT annual meeting, will allow the Center to operate more generally and accommodate additional ministries.